There was a point in my life where the routines of each day held me firmly in their grip. I set out each morning on travels that took in visits to three schools a day, to a backdrop of a small but select cluster of albums, the CDs that stayed in my car. John Lennon Greatest Hits, I recall, has a track I have long loved, Watching the Wheels. According to my routines, this song played somehwere around the point at which I climbed the winding Fosse Way to the rural villages that make up South Warks. From that point on, my day began as a local authority support service advisor working on behalf of children with special educational needs. On 5th October I received a diagnosis of grade 3 breast cancer. It has been a tumultuous time. The diagnosis sets a seal and a date to what was once feared and dreaded. During these demanding times, I have gained a great pleasure from listening to music, guided by an inner voice that draws me to this song or that soundtrack for reasons I fail to comprehend, until I make time to listen, and then I understand. I wonder at the power of our subconscioius mind which has such great reserves of inspiration, knowledge, wisdom that we too readily dismiss. So, here are the lyrics to one of my all time favourite John Lennon tracks – and a favoured youtube clip to boot. There is something here in this song that holds me fast. I have been concerned, pre-occupied with how unproductive, business-wise, this past six weeks has been. This diagnosis is the most damned of intrusions into a year that I have planned as ambitious, forward-looking, active on many fronts, professional and private. My glorious business trip to Bologna not that many weeks before heralded the start of new opportunities. My dashing from south to the north of England, speaking on Child Poverty and Green Papers, and Testing and Assessment, on matters that form the fulcrum of my business, all now seem but a shadow of my past, my pre-cancer existence. Hospital visits there have been a-plenty this past six weeks. Visits that I assume will be a brief dash in and out, have lasted a morning. Tests and checks that I thought may be inconsequential, have left me in tears, full of sorrows and anxieties that seem to rid the body and mind of any reasonable focus or purpose. There have been days when picking up my Breast Cancer Care folder, a guide provided by the hospital, have caused tears to fall that will not stop for the most frustrating duration. Still I have not learned lessons that are waiting for me, as I fight this futile battle against the injustices of my illness. But slowly, slowly, I am adjusting my expectations of what might be possible today, tomorrow, and for the weeks to come and finding there is much to contemplate. On 7th November I had surgery, a lumpectomy to remove the tumour. It seems to me, though others may view it differently, that this surgery marks a turning point, a significant shift and forward movement. It is a relief, after all the anxieties and concerns, that surgery is behind me. Treatment still is to come, and the results – the results weigh heavily on my mind. But there is no denying I feel a sense of euphoria that the tumour has been removed. Today is the first day I am home alone, having a pyjama day, with all good intentions to read the magazines that await my idle attention, gaze at the flowers that adorn two rooms of my home, and immerse myself in Wolf Hall. I shall try not to eat too many of the M & S biscuits that call to me from their glistening tin of gold. My son and daughter have been a brilliant and stirling source of support, company, amusement, interest and great practical help. My son stayed with me throughout a series of hospital visits this week leading up to surgery, and was present during my less lucid and most anxious moments, before I was taken away to theatre. We have had some very funny moments, and some more thoughtful, poignant times over evening meals, breakfast, and on a long walk yesterday through the Warwickshire countryside. I came back tired, but delighted that my daily routine – at least for a short while – incorporates an afternoon siesta. One very dear friend, fellow Twitterer and correspondent @wishdasher, sent the most thoughtful and eloquent email earlier this week, to support and guide me through this trying time. I printed out the email and had it with me to read and re-read, before surgery, and in that drawn out, slightly surreal time, waiting for permission to go home in the early afternoon. Finally, alongside this letter from Q, I have been much moved by the best wishes and concerns of so many dear friends and my family. What a great source of comfort and strength are those who love us, or hold us in their thoughts. My breast cancer care guide, ‘Treating Breast Cancer’ advises that the period post-cancer treatment, a time that should be one to celebrate, can create its own set of problems, as the constant attention and concern of others, diminshes as the treatment progresses and health is restored. There is a further period of adjustment to make as our role in many areas of life, with family, with work colleagues, in a professional capacity, has changed irrevocably. Time moves on. So much to consider, but I am mindful of the counsel of my dear friend, and shall resist the temptation to anticipate the future. I shall dwell instead, in the present. Earlier this week I tweeted that I was in need of courage. 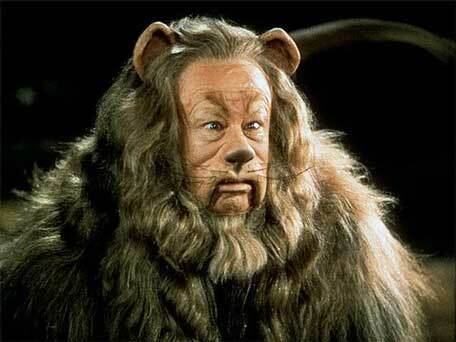 It has amused, distracted and interested me to find extracts from a range of sources on the theme of courage, but one that I return to and look on fondly is the quest of the cowardly lion in the Wizard of Oz, to find courage. Now, you must excuse, for I have magazines to read, flowers to gaze upon (and attempt to paint later, with my newly acquired watercolours), Wolf Hall at my side, and a friend calling. 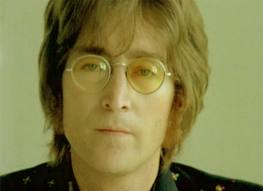 I am very much of a mind to emulate John Lennon’s good advice, and watch the wheels go round and round. If you have time to spare a thought for me, wish me luck when my results come through. Godspeed and my fond wishes always. Very good post, John Lennon is an Icon !! So sorry to hear that news and I really, really hope things continue to take you on an upward trajectory. I was touched to read your post – music is always a comfort to me too. As for cancer, it can just do one, as far as I’m concerned. There seems to be a lot of it about, just now. The son of a very good friend of mine has pretty serious cancer, only mid-twenties and so full of goodness and promise. Thank you so much for your very kind words. Yes, music is a great solace, inspiration, mood-shifter and much more. I am feeling very well post-surgery, and surprisingly upbeat, which I suspect is the great relief that one part of the journey is completed – or at least for now. Cancer rather an unpleasant disease – it is the greatest irony that I feel well – yet have to go through so much that will make me feel increasingly less well, to rid myself of something that I have been blissfully unaware of, until not so many weeks before. It is most debilitating, what it can do to the emotions – so many fears and anxieties. But for now, all progressing well. I hesitated posting, but, I do not think I would be true to myself if I did not. Regards for your friend’s son – I hope there is light at the end of the tunnel.